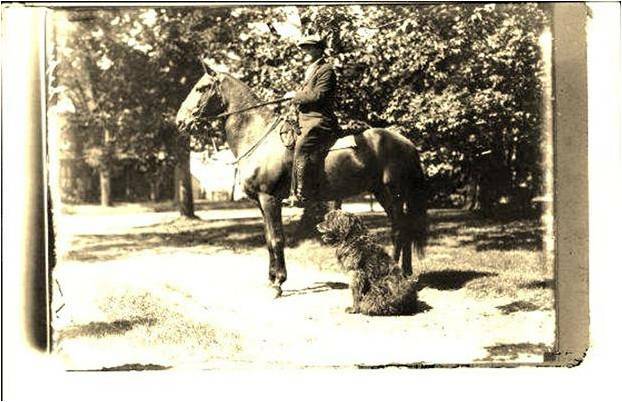 This file photo shows Lt. Col. Charles Bent riding his war horse Fritz, alongside the Belgian sheepdog Bruno. HALIFAX — On a farm in Paradise, N.S., lies the grave of a horse named Fritz — a warhorse, it turns out, that survived the horrors of the First World War and lived out his final days in peace in Canada. As the fictional tale of the Steven Spielberg film War Horse appears on movie screens across North America, and as a stage version of the novel by the same name opens in Toronto, the real-life saga of a true Canadian warhorse is now emerging out of the past. The details of Fritz’s story have been investigated for several years by retired Toronto brigadier-general Greg Young — an Afghanistan veteran and former reservist with Toronto’s 48th Highlanders regiment. From 1914 to 1918 the regiment fought as part of Canada’s 15th Battalion, and Young now heads up the 15th Battalion Memorial Project, which preserves and promotes the unit’s wartime history. For most of the First World War the battalion was led by Lt.-Col. Charles Bent, a Nova Scotian who, despite his slight frame and bookish looks, was in fact a highly competent field commander who was widely respected by his men. In 1918, as the war was winding down and Allied forces were finally pursuing the German army out of France, Bent and his unit were ordered to assault a German strongpoint called the Crow’s Nest. “They captured the Crow’s Nest in the early morning of Sept. 1,” says Young. “The Germans did three counter-attacks to take it back, but the Canadians held it. Afterwards, during a lull in the fighting, in rides this German officer on horseback, who obviously wasn’t aware what the hell had happened, and that the ground had changed hands. The two Germans were sent to a prison camp and the horse — having survived its service with both the Russian and German armies — was taken by the Canadian soldier who captured it, Capt. Gordon Winnifrith. Winnifrith was killed in action a few weeks later at the Battle of Canal du Nord, and the horse, renamed Fritz, was adopted by Bent. Remarkably, both Bent and Fritz survived the war and when Bent came home to Canada he took with him not only the battalion’s mascot, a stray Belgian sheepdog named Bruno, but also Fritz. After the battalion was demobilized in Toronto, Bent returned, with Fritz and Bruno, to his family farm in Nova Scotia’s Annapolis Valley. Young’s research into the story hit a dead end at that point, until this week when he discovered Bent’s son — Donald Bent, now 91 — living in Nova Scotia. He says he remembers, as a four-year-old boy, his father riding Fritz around the apple orchards on the property. “My father was quite proud of that horse. It had been a German horse, and some German colonel owned him. The German went to a POW camp and Dad took the horse home. Several years after the war Fritz grew old and sick, and Bent euthanized the animal. “At that time there were no vets around, so Dad took him and shot him,” his son says. Fritz was buried alongside Bruno on the farm property, where the graves remain today. Bent, who earned the Distinguished Service Order in the war, died in 1955.